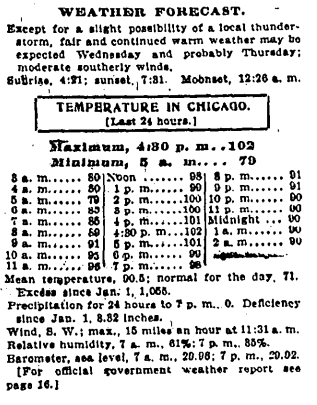 July 5, 1911 – An unabated heat wave in the opening days of July reaches a high of 101.5 degrees at 2:00 p.m. on July 5 with devastating results. In the first five days of the month 125 infants have died from heat-related causes. The fear is that a far greater number is to come. 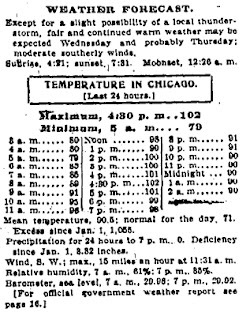 Dr. C. St. Clair Drake of the Bureau of Vital Statistics says, “The soured milk fed the children in these hot days has started intestinal disorders which are rapidly growing worse.” On this day 44 men and women die with one man, “crazed by the high temperature” [Chicago Daily Tribune, July 6, 1911] hanging himself. Ice companies are having tremendous difficulty in transporting ice to the outlying sections of the city since so much of the shipment melts before it reaches its destination. Shrinkage is usually about ten per cent; ice companies are losing close to 80 per cent of their shipments in trying to get it delivered. As a result, fresh milk, fruit and other food items are in short supply in some parts of the city. Companies are also having difficulty in keeping their horses up and working. Forty horses have died on city streets and over 200 have been affected so much that they cannot work. The Humane Society has received 300 emergency calls since July 3. On this one day alone over 300 horses are felled near the Loop with just one fountain for teamsters to water their horses in the area, that in front of the Y.W.C.A. on South Michigan Avenue. Cooling temperatures and a slight chance of rain is predicted for July 6. July 5, 1915 – The South Park Commission places plans for the improvement of Grant Park on exhibit in Blackwell Hall at the Art Institute of Chicago. 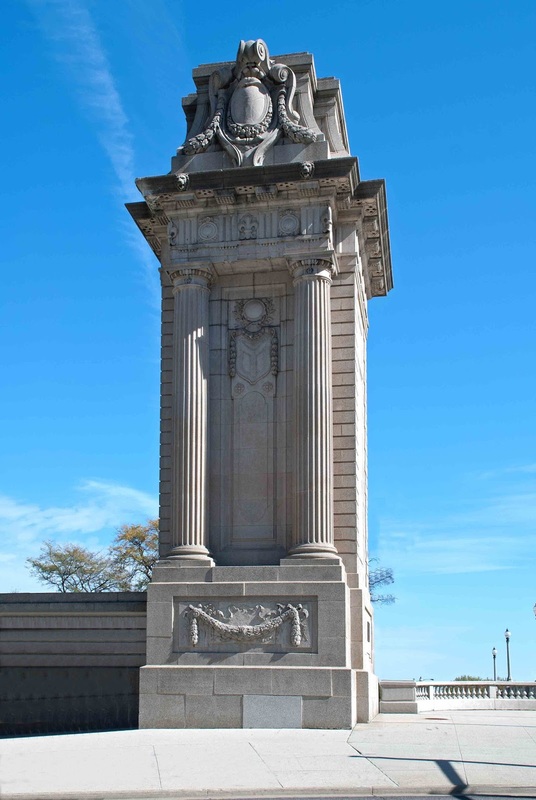 The exhibit includes a model of the peristyle, designed by Edward H. Bennett, that will stand in the northwest corner of the park at the corner of Randolph Street and Michigan Avenue. Other plans include a pair of pylons sixty feet tall to mark the entrance to the park and a line of trees from Randolph Street to Twelfth Street with a gravel walk 30 feet wide beside them. J. F. Foster, superintendent of the South Park Commissioners, says that when the work is completed Grant Park “will be a beauty spot unsurpassed by any of the formal gardens in the United States and equaled only by the public gardens of Italy.” [Chicago Tribune, July 4, 1915] One of the great pylons, part of the 1915 plan, that today greets visitors to the park is pictured above. Note the "Y" symbol in its center panel.